It’s that time of year again, when parents are frantically—yet with great relief—preparing their children to go back to school. And teachers are preparing just as frantically to have their classrooms ready: an inviting space that is offers structure, but not rigidity, beautiful and engaging displays, and equipment ready to be manhandled by a new group of curious children. Then there is all the behind-the-scenes work of organizing class lists, developing the year’s curriculum, securing resources, etc. Then there is the nerve-wracking task of planning that first activity, the one that sets the tone for the whole year. Our classroom is active (and interactive). Music class is not just about recorders, Mozart, and “Frère Jacques.” It has a relevant place in society, culture, and in our everyday lives. I have some different variations of the activities, and I don’t think I’ve used the same one twice. 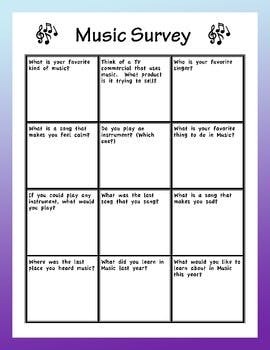 First I give the students a survey to find out what kinds of music they enjoy, what instruments they’ve learned, what they have learned in music class before (even if I taught them last year, this helps me know what they remember), and what they hope to learn this year. Then I do a music class variation of the ubiquitous “find someone who…” icebreaker. It gets kids talking—and talking about music! You can download the version of the Music Survey and Find Someone (currently being updated) I used this year for free, if you are interested. 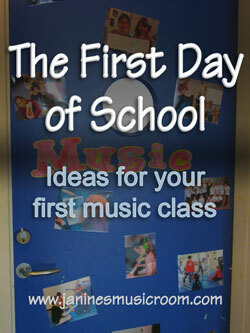 Check out The First Day of School, continued, to see how we start making music. How do you start your school year? What kinds of activities do you do to get the kids excited about the school year? Great ideas for that first class!! I like to teach a simple song right away. And I take pictures of each class to help me learn their names. I’m going to try your find someone sheet later in the year or maybe for a substitute to do if I’m sick. Thanks for sharing that! !